A landslide on Sunday hit the riverside settlement of Isonbiri, Odi in Kolokuma-Opokuma Local Government Area of Bayelsa State, destroying ten buildings located along the bank of the River Nun which passes through the community. Though no life was lost, the incident which occurred between 7 am and 9 am, caused panic in the predominantly fishing and farming settlement. The affected section of the community, it was gathered, had been under threat caused by water erosion. An indigene of the community, who spoke anonymously told Vanguard that it could have been disastrous if the incident had happened at night. “it is one of the many environmental challenges confronting our communities especially those along the river banks. This could have spell disaster if the landslide had occurred at night when the occupants of the affected buildings must have retired to bed. “But thank God it happened in the morning. It started as a tremor which triggered panic in the area forcing many families out of their homes. “Two hours later, at exactly 9 am, the ground caved in and the buildings collapsed. We thank God no life was lost,” he said. The Chief Whip of Bayelsa State House of Assembly and member-elect for Kolokuma/ Opokuma constituency I, Hon. Tonye Isenah who is also an indigene yesterday paid an unscheduled visit to the community following the incident. Hon. 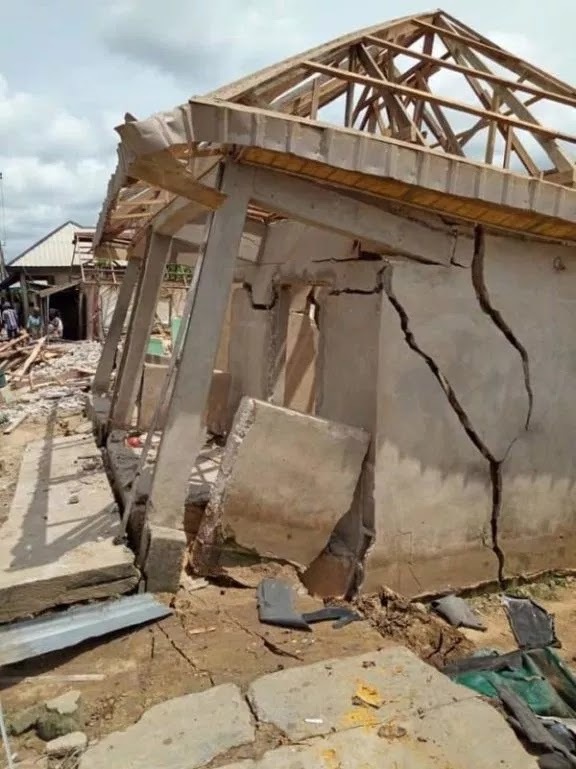 Isenah lamented the level of destruction caused by river erosion and called on the federal and state government through the ministry of environment and other relevant agencies to come to the aid of the people. So sorry.they should be relocated.thank God no one died. Too bad. I pray the residents are sorted out soon. Isnt it that community Obasajo sent soldiers to destroy? Thats where Timaya is from. Sorry, Timaya isn't from Odi but Sampou. It's his mom that's partly Odi. This is what happens when we have a government who does not give a damn about anything. We need serious erosion control. Erosion has taken half of Kaiama away. There was severe erosion last time l travelled through Enugu.. What type of government do we have?? Lots of money spent but no visible projects to show for all that money. Na wa!! Well, you should ask the state governors and the academics in the south what they have done with the gully erosion fund. The fund has been flowing since 2015 and they just eat it without any implementation. Thank God no one died. Oh! I served in Bayelsa. And I did my camp at Kaima Opukuma local govt. I just pray they help the residents of this community.These are effects of climate change. Natural disaster should not join hands with Nigeria's man made disasters, God please send us help now.